After going through the key concepts in the book [Six Thinking Hats by Edward de Bono], again (thanks to an agile asynchronous book brigade) - the following picture was produced. This helps us illustrate how a simple practice can be kept simple and applied to a very basic idea and still generates tremendous output. 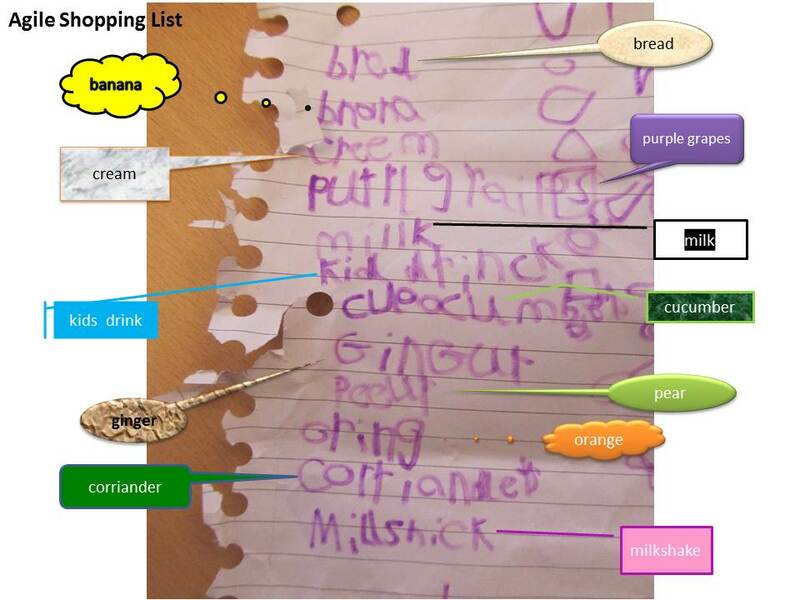 The picture in the middle shows a basic list that my five year old son wrote as his first shopping list. As you can notice - he is learning how to write and is using all his knowledge of phonics and alphabets to the best of his currently evolving abilities in writing. Many lessons can be extracted from the list and I have used it for a basic practice of applying the newly acquired yet classic technique of lateral thinking. 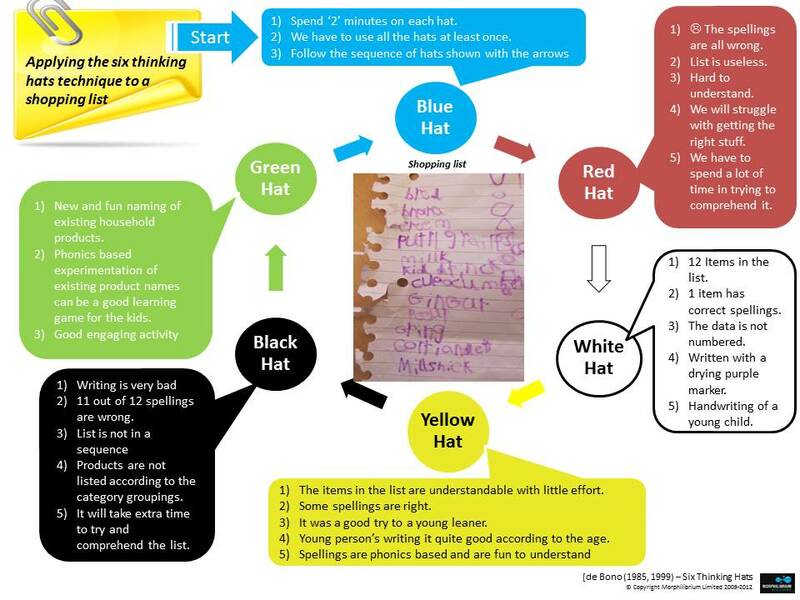 In case the above process, mind-map, case study is not readable the following text will help. Spend ‘2’ minutes on each hat. We have to use all the hats at least once. L The spellings are all wrong. We will struggle with getting the right stuff. We have to spend a lot of time in trying to comprehend it. 12 Items in the list. 1 item has correct spellings. The data is not numbered. Written with a drying purple marker. Handwriting of a young child. The items in the list are understandable with little effort. It was a good try to a young leaner. Young person’s writing it quite good according to the age. Products are not listed according to the category groupings. It will take extra time to try and comprehend the list. New and fun naming of existing household products. Phonics based experimentation of existing product names can be a good learning game for the kids. Six Thinking Hats has been a classic for decades. The ideas for group thinking and being generalists at evaluating concepts from various aspects has been well known to the industry. Be it KJ Analysis or affinity or any other similar technique. 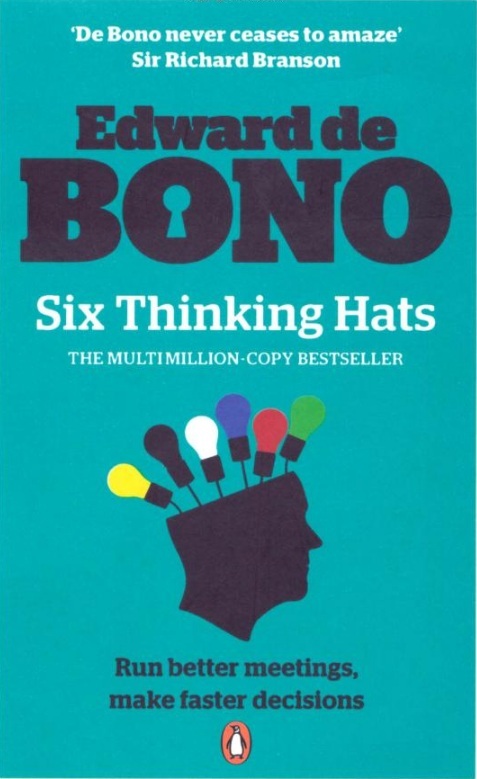 Edward de Bono has structured the behavior driven emotional evaluation of business ideas into a practical group thinking system. It helps with the team building as well as group thinking by intentionally empathizing with others' point of view. The following visual is a concise summary. 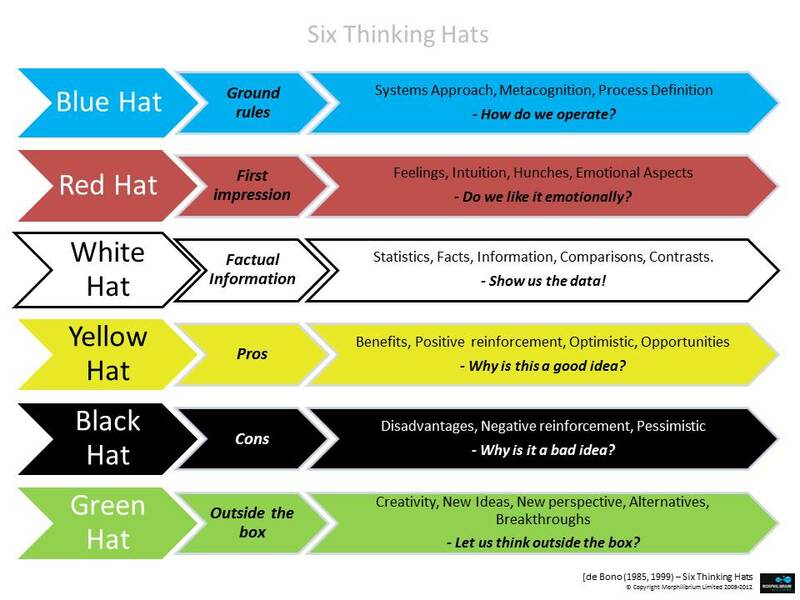 It serves as a starting point for new teams that are trying to use this lateral thinking method into their current business innovation. Stay tuned as in the follow-up post, I will share a simple example where the above technique is applied to a shopping list. 'backlog': "A list of items to do". 1. a reserve or accumulation, as of stock, work, or business: a backlog of business orders. 2. to hold in reserve, as for future handling or repair. ﻿Many a times we take requirements superficially and ignore the essence and value of a backlog. A considerable majority of us create to do lists, task lists, work logs, backlogs, activity lists or something similar for various personal and professional reasons. To assess the scope of what we have to do or to remember the things to do, using a checklist is a faily common practice. My five year old wrote his first list recently and it gave me numerous points to ponder from agile and lean transformation paradigm. The initial question that popped up was whether to correct his spellings while he is trying to get the grasp of phonics based language constructs or to use common analytic sense and let him gain initial confidence? ﻿﻿﻿﻿I am glad that the choice of enjoying the moment proved fruitful as he is much more confident after the event. Bringing this back into perspective, mature agile teams master the skill of living on uncertainty. With regular observations of the actual product ownership function - the imperfect assumptions are quickly exposed. The added benefit is that no lengthy and detailed documentation is created or maintained. As facebook recently mentioned, "Code wins arguments"
The customer and the team are flexible enough to build sand castles regularly and only convert the sections into concrete after actual observation from the end user. This allows the notion of true progress instead of paper based semi-hypothetical reporting. Building solutions that are flexible and easy to change with assumptions integrated into the code - change becomes inexpensive right from the start. The shopping list neither meets the spelling, nor the grammatical acceptance criteria. However - it is still perfectly usable and with little effort can meet the same objective as a perfect list would have done.